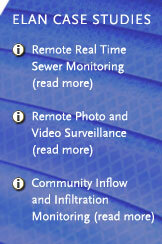 ELAN Technologies designs, installs and services fresh water and wastewater SCADA systems. These systems consist of software and hardware solutions that control the municipal fresh water and wastewater treatment facilities. A typical fresh water system may consist of one or more pumping and storage facilities. The water for the fresh water supply is obtained through several methods. Well pumps extract water from under ground aquifers. Surface water is collected from lakes and rivers. Water is purchased from a water provider who obtains water using either of the previous methods mentioned. A pumping facility may consist of one or more water pumps for collecting water and/or maintaining delivery system pressure. These pumps would be controlled based on the water elevation in overhead tanks, water elevation in ground storage tanks or water pressure in the delivery system grid. Typical wastewater treatment systems consist of a main treatment facility and one or more wastewater collection stations called lift stations. The lift stations simply pump the wastewater from a low lying location to the treatment facility. Wastewater moves through the plant undergoing several purification processes and is released into rivers or streams when completed. Environmental Protection Agencies regulate water quality. Strict guidelines must be followed by the water provider in order to assure high water quality. These guidelines dictate types of chemical treatment required for water quality improvement as well as acceptable limits on water born contaminants. These agencies also regulate the quality of purified wastewater that is released into the environment. ELAN Technologies designs these SCADA system control schemes in accordance with engineer and/or customer specifications. Upon customer request ELAN Technologies will solely engineer the system control scheme. A typical SCADA system consists of a central monitoring and control station and one or more remote stations. The central station will collect data from these remote stations via dedicated telephone line modem links and/or industrial wireless radio networks. 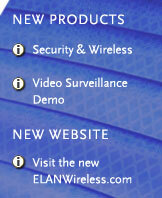 The majority of our solutions use industrial wireless systems designed and installed by ELAN’s industrial wireless group. The central station will also send data to these remote stations via the communication network. The trend in the market is towards state of the art “Human Machine Interface” (HMI) software running on a desktop computer at the central station. This software communicates with a programmable logic controller (PLC). The PLC then communicates with the remote stations via the above mentioned links. The PLC is “intelligent” and will maintain basic system control in the event of a computer failure. The central station can utilize only a PLC for control and employ a simple graphic interface for control setting adjustment and system monitoring. The remote stations are primarily PLC based and can be programmed to provide basic system control in the event of a communications failure. The remote PLC can employ a simple graphic interface for control setting adjustment and system monitoring giving the operator a view of the entire SCADA system from these remote locations. ELAN Technologies configures all of the software components of a SCADA system. This includes the “Human Machine Interface” (HMI) graphics, “Programmable Logic Controller” (PLC) functions, operator report print-outs and system failure alarming. These elements are developed based on customer specifications and have basic similarities from job to job however; variations exist between customers and must be addressed. The HMI graphics portray the water supply or wastewater treatment system to the operator and must be clear, intuitive and simple. The HMI collects and archives system events, alarms and data from the PLC. This data can be reviewed to assess system efficiency. This data is also used for system reporting. The data is shared with third party software that is configured for report printing. The PLC carries out logical repetitive control iterations and communicates with both the HMI computer and the remote stations. The PLC must be configured to collect and organize the system data. 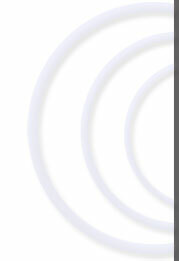 Proper organization insures efficient communications between the HMI computer and the remote stations. The PLC at the remote station can be programmed for local control in the event of a communications failure. It is primarily responsible for the collection and organization of the remote station data and transmission of the data to the central station PLC. After successful installation of a system, ELAN Technologies provides warranty service and repair service. In some circumstances ELAN Technologies provides repair services to systems other corporations have installed. The primary clientele is made up of governmental municipalities; however, private corporations also use our services. ELAN Technologies is mindful of governmental regulations controlling water quality as well as safe electrical system installations. Tom Kirkland, President of ELAN Technologies a member of the Illinois Section American Water Works Association (AWWA) Water Utility Council. Water Utility Council Members are responsible for promoting an effective legislative and regulatory environment for the water community. We provide education to our membership (customers) on pending legislation and regulations that may impact the water industry. We also meet with the elected officials to promote AWWA as the leading source for information and expertise within the drinking water profession, as well as supporting a strong environmental commitment and sound stewardship of our precious water resources. Day to day operations at ELAN Technologies center on customer needs. Normal business hours will typically be the same as the customer’s normal business hours. This dictates normal business hours for ELAN Technologies to be from 6:30AM to 4:30PM Monday through Friday. Service schedules are flexible. Emergency service calls are given priority over all service and projects and will be available 24 hours a day, 7 days a week. ELAN Technologies is ready to serve. If you have your own equipment and need our expertise do not hesitate to contact us.